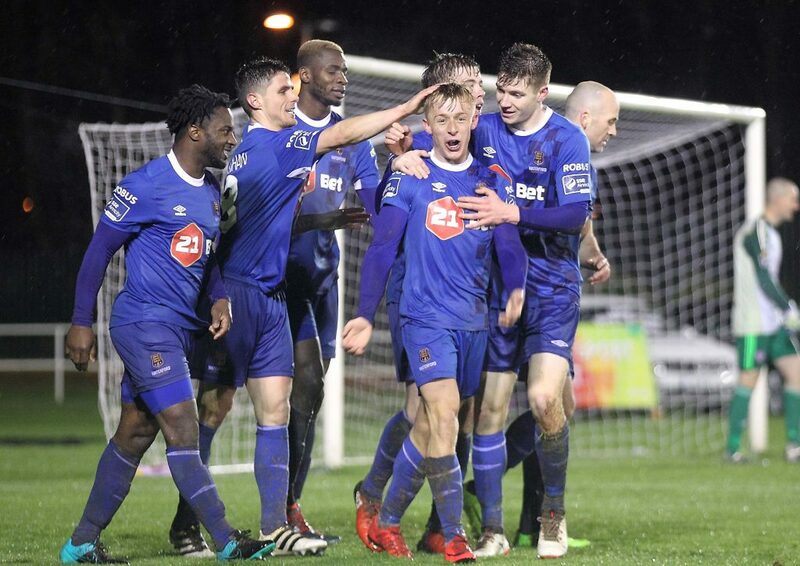 Dean O’Halloran celebrates with team-mates after he scored the winner against Derry City in the Premier Division last February. He this week signed a new deal at the RSC. Photo: Noel Browne. Waterford FC have added Dean O’Halloran to their squad ahead of the start of the SSE Airtricity Premier Division season, which gets underway with a home game against Shamrock Rovers, on Friday, February 15. O’Halloran, who will enter his third season as a Blues player, has become a favourite with the young supporters and he will be a good addition to the Blues squad that is being currently put together by manager Alan Reynolds. The attacking minded player started his career with Southend United in Waterford before moving across channel to play with Fulham. After spending four years with the Craven Cottage club, Dean moved back to Ireland where he joined Bohemians before making his move to the return to Suirside. After starring on 20 occasions for the club in their return to the Premier Division last season, O’Halloran played a role in a number of wins, including scoring the winning goal in the opening game of the campaign in a 2-1 win over Derry City. Speaking on his decision to re-sign for the club, O’Halloran said, “”I’m delighted to be back for my third season at the club. We have a good squad being put together at the moment so we’ll be looking to build on last year. In confirming his latest signing ahead of the new season, Waterford FC manager Alan Reynolds said, “It’s great to have Dean with us again for the 2019 season. He came in before the 2017 season and was a great lad to have around the club as we won the league. The Blues will get their pre-season campaign underway tonight (Tuesday) when they take on Premier League side Hibernians at Ozier Park with a 7pm kick-off before entertaining Wexford FC in their second pre-season fixture at the RSC on Saturday afternoon with a 3pm kick-off. Alan Reynolds side will take on Limerick FC on the following Sunday before hosting Bray Wanderers on Saturday, February 2 before completing their pre-season with an away game against First division favourites Shelbourne on Friday, February 8. The season gets underway on the following Friday night.